There are a number of requirements you need to meet in order to qualify for a non-recourse loan. From the correct documentation to the correct type of rental property you’re looking to purchase, you need to have all your ducks in a row when you start the application process. But even before that happens, you need to make sure your credit’s in a good place — and for that to happen, you need to make sure your debt is being paid off in a timely manner. We’ve talked about the importance of a good credit score and how to make that happen, but in this blog, we’re going to dive into some of the ways you can effectively pay off your debt. Take a look at some great ways to start tackling your debt, and when you’re ready for a non-recourse loan, get in touch with our lenders at First Western Federal Savings Bank today! Debt for many of us is like the food that’s been in our fridge for too long — we don’t want to look. We know how bad it’s going to be, we’re not ready for the sights and the smells that are bound to overtake us, and so we leave it there in the fridge for just a little longer. But here’s the thing that our debt and our 10-day-old shrimp linguine have in common: we’ll never regret dealing with it sooner. In fact, the longer we put it off, the grosser it gets. This is why one of the first important things you can do with your debt is to simply keep tabs on it. Be in full knowledge of what you owe, and to whom you owe money to. Keep an organized system — whether that be a spreadsheet or a note on your phone — that tracks your current debt situation, showing credit card debt, student loans, car payments, etc. It seems like a scary thing, but knowledge is power, and it can make all the difference in starting to better manage and pay off your debt in the future. This might seem like a no-brainer for some, but considering nearly two-thirds of Americans do not use a budget, we’re making a point to cover it. Once you know what you owe, it’s essential that you bring it into your budget — and if you don’t have a budget, now’s the time to start (it’s a lifesaver that nearly every financial guru will recommend doing). Take all of your finances into consideration, and factor in your monthly debt payments as well. This helps you manage your money and funds as a whole, in addition to helping you work towards paying off your debt consistently. For many of us, debt can feel like this storm cloud that looms over us with no sign of leaving anytime soon, and in that way, we are letting it control us. As a better practice, you can be more successful in paying off your debt when you set achievable goals for yourself. This provides an added motivational factor, and sets a timeline in place to help push your debt repayment process. And, of course, reward yourself when you pay it all off! Even if you just pay off your credit card, that’s a huge accomplishment, and should absolutely be celebrated. Just like you want to keep track of all your varying debt sources, there can be great merit in consolidating loans when possible. This makes it easier to manage all your debt, because it will be all in one place. As we’ve said in the past, if it boils down to paying off bills in a matter of minutes, and paying off the same number of bills, spread across several lenders in triple the time, we think we know what most people would choose. You already aren’t a fan of your debt (who is) — make it simpler to manage and pay. As we mentioned, you’ll need to have a good credit score as one key component in the process of applying and qualifying for a non-recourse loan. Anytime you have a late payment, this puts you at risk for lowering your credit score — and repeated late or missed payments will absolutely drain it. For this reason, it’s essential to set up automatic payments whenever you can. This is a useful tool for all of us, but particularly so for anyone who struggles to pay things by a certain deadline. Paying off debt is not only like cleaning out the fridge, it’s also like turning in your high school homework — your algebra teacher might forgive you the first time your payment is late, but eventually, your grade will be affected. If you’re unable to set up automatic payments for whatever reason, commit a certain day of the month to be your designated “pay day” (we know, not nearly as fun as the other kind). Tackling your debt in a timely manner doesn’t only help your credit score, but it also helps you reduce it consistently in the process. 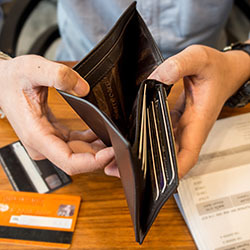 Credit card bills and other forms of debt often have minimum payments, in which you’re only required to pay a certain amount. As tempting as this can be, paying the bare minimum is not exactly helping eliminate your debt as well as it could be. Instead of solely focusing on the minimum payment, think about what you can reasonably pay each month. If, for the time being, that number is the minimum payment, that’s okay — focus on paying that in a timely and consistent manner until your finances are looking a little brighter. If you can do more and still be comfortable with it, go for it. This will help expedite the debt repayment process — and in the world of paying off debt, saving even a few months will feel like such a relief. Oftentimes, our monthly payments and overall debt are significantly higher due to interest rates. Refinancing presents the opportunity lower your interest rates on your debt or loans, meaning you won’t owe as much in interest. 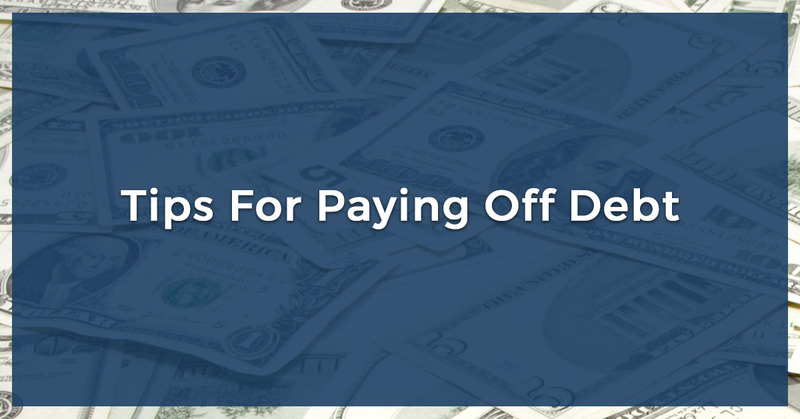 This is a great way to more effectively pay off your debt, because it means you’ll have less to pay! In a future blog, we’ll talk about some of the facts and statistics on debt in this country. Debt is something that affects nearly all of us in the United States, and when we have a better handle on managing and paying off their debt, we all benefit. Not only can we better eliminate debt, but by doing so, we show that we’re more eligible and capable to take on bigger financial investment opportunities, such as applying for a non-recourse loan. With a non-recourse loan, you can invest in rental properties to be used for vacation or long-term tenant purposes, which can help generate revenue to your portfolio. This is an excellent opportunity for your future financial goals and aspirations, and our non-recourse lenders would be more than happy to help you get started. Speak with a team member from First Western Federal Savings Bank today!